Lucasfilm and Marvel announced a new Star Wars comic book miniseries, titled Star Wars: Galaxy's Edge, that will tie-in with the upcoming theme park expansions of the same name at Disneyland and Disney World. 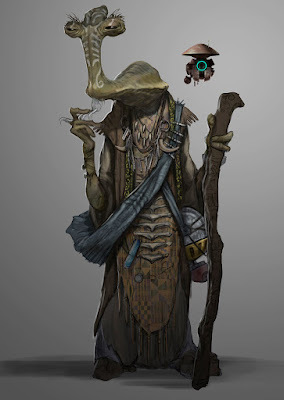 The story will be set on the planet Baatu (the same place that the theme park will be set) and will follow the character Dok-Ondar The series will debut in April, and will be written by Ethan Sacks and art by Will Sliney. "Readers of the five-issue miniseries will be the first to meet the infamous Dok-Ondar, the Ithorian collector of rare antiquities, and find out what happens when the First Order reaches the edge of wild space. The key to saving this lawless outpost might just involve a job pulled long ago by none other than Han Solo and his cohort Chewbacca." 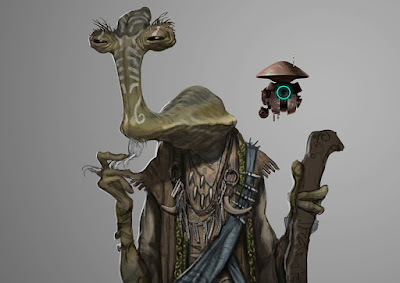 If the name Dok-Ondar sounds familliar, it's because the character was referenced in Solo: A Star Wars Story. He was, apparently, on Dryden Vos' yacht during the party where Han Solo and Qi'Ra reunited and first hatched the plan to make the Kessel run. Qi'Ra mentioned him when she asked one of the servers, "Have you been attentive to Dok-Ondar?"